Raises input A to the power of input B, and outputs the result of the operation. Rises the value of the Bas input to the exponent of the value of the Exp input. 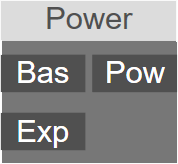 Pow: Result of the operation: Bas ^ Exp.